At the time of publication, the following ASCD resources were available (ASCD stock numbers appear in parentheses). For up-to-date information about ASCD resources, go to www.ascd.org. You can search the complete archives of Educational Leadership at http://www.ascd.org/el. ASCD's Whole Child approach is an effort to transition from a focus on narrowly defined academic achievement to one that promotes the long-term development and success of all children. Through this approach, ASCD supports educators, families, community members, and policymakers as they move from a vision about educating the whole child to sustainable, collaborative actions. Now That's a Good Question! 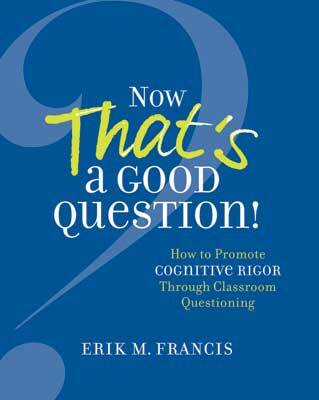 How to Promote Cognitive Rigor Through Classroom Questioning relates to challenged, engaged, and supported tenets. SAFE: Each student learns in an environment that is physically and emotionally safe for students and adults. SUPPORTED: Each student has access to personalized learning and is supported by qualified, caring adults. CHALLENGED: Each student is challenged academically and prepared for success in college or further study and for employment and participation in a global environment. For more about the Whole Child approach, visit www.wholechildeducation.org.